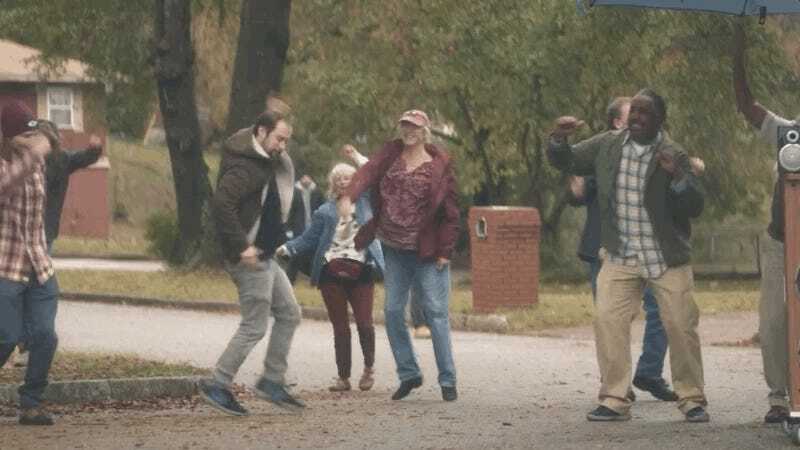 A group of people dancing to “Ring My Bell” as they’re erased in the apocalypse. In a landscape that’s overcrowded with expensively-produced, live-action adaptations of comic books, Doom Patrol stands out in the canny way it picks and chooses some of the best tropes from the genre, tosses them into a blender, and turns them into a strange but smooth mix of human emotional arcs and unhinged, nonsensical storytelling. It’s fun like that. Eventually, all of these cape shows get around to an apocalypse that comes in one form or another that, conveniently, only the titular heroes are able and available to prevent. Generally, when we complain about the overuse of the apocalypse as a plot device in superhero programming, it’s because there isn’t all that much meaningful differentiation from one to another (there’s some sort of MacGuffin that’s gotta be destroyed or else everyone dies)—and, if we’re being honest, the apocalypses in movies and TV shoes rarely feel emotionally significant. It took Marvel 10 years, 20 movies, and a bunch of TV series to make its grand apocalypse meaningful, and even now, we all know that most of the people Thanos killed are probably coming back in Avengers: Endgame. Rather than turning Grant Morrison and Richard Case’s Doom Patrol arc about the Cult of the Unwritten Book into a season-long story culminating in an epic battle to decide the fate of the universe, episodes four (“Cult Patrol”) and five (“Paw Patrol”) treat the entire ordeal much more like a monster of the week on cosmic steroids. It’s a serious problem, to be sure, but it’s one you’re never really in doubt the Doom Patrol is going to be able to overcome, out of sync with one another though they may be. Even with the help of the charming chaos magician (John Constantine knockoff Willoughby “Kip” Kipling) played by genre mainstay Mark Sheppard, the Doom Patrol end up unable to prevent the cult from getting their hands on the Unwritten Book—a teenaged boy named Elliot—and using his powers to awaken the Decreator, a giant eye in the sky that...well, it unmakes them. What Thanos does with the Infinity Gauntlet and Stones, the Decreator does with a gargantuan blink and piercing stare that causes anything it’s focusing on to dematerialize. Unlike Thanos, who’s ultimately one person working to enact his own will through a plan, the Decreator is really a weapon of sorts being wielded by the Archons of Nùrnheim, two grotesque, harlequin-like puppet monster people who live in what’s essentially a pocket dimension within a snow globe. They were giant? But also really tiny? While Rita, Larry, Cyborg, and the recently-returned Chief (soon to be abducted by Mr. Nobody once their world-saving business is completed) do their best to make sense of the Decreator’s presence and avoid its powerful gaze, Cliff and Jane make their way through Nùrnheim in search of the Archons in hopes of figuring out how to thwart their plans. Something about being in the strange place pulls out Penny Farthing, an English-accented alter of Jane’s who’s yet to make an appearance, and gives the two of them a chance to talk about the odd way that some of Jane’s other alters (like Hammerhead) have been aggressive toward Cliff. “Paw Patrol” picks up after the Archons have demonstrated that they’re far too powerful for Cliff and Jane to physically fight with any of their abilities, and so, dejected, Jane storms out of the castle with Cliff in tow. While the episode is obviously about the apocalypse at hand, “Paw Patrol” also understands that in order to be a successful hour of superhero television, the world-ending threat can’t really be the sole or even primary focus here. Instead, the episode is more of a dive into Jane’s psyche and her past which, as luck would have it, touches on Nùrnheim and the Decreator. Despite being relatively at peace with her other personae as of late, it’s always been obvious that there’s some sort of childhood trauma in Jane’s past that might have played role in the fracturing of her mind and vast metahuman abilities. In DC’s comics, the trauma is the result of Kay Challis, Jane’s original core personality, being abused by her father, and while Doom Patrol hasn’t gone in that exact direction yet, one of the Archons is able to bring Kay, here a child, up to the surface of Jane’s mind, which alarms her deeply. While the specifics of what happened to Kay aren’t explained, “Paw Patrol” illustrates what Jane’s life was like in the years following her mental split. The episode jumps around to various dates and finds Jane or any one of her various personalities moving through the world in different ways. In 1976, one Dr. Harrison is being tortured in a mental asylum where she becomes the leader of a cult (with a nudge from Mr. Nobody), and by 1977, Jane’s thrashing at a punk show in New Jersey. In the present, Penny Farthing/Hammerhead are trapped in Nùrnheim with a distraught Cliff, and everyone in the outside world is pretty much just scared shitless that the Decreator’s gonna look at them. Dr. Harrison using her powers of suggestion to force a man to kill himself. “Paw Patrol” begins to hint at the Doom Patrol’s destiny to become part of something much larger and more central to protecting existence itself as we see that, while being kept at the mental institution, Dr. Harrison began planting the seeds for a specific plan that would ultimately stop the Decreator. In convincing a handful of followers to hold fast to their faith in the so-called Recreator, Harrison’s able to create a failsafe for the event of the Decreator’s arrival. Somehow, one of Harrison’s followers just...shows up in Nùrnheim, kills the Archons and their minions, and points Cliff and Jane to a bell in a tower that must be rung. Echoing the episode’s choice use of Anita Ward’s “Ring My Bell,” Jane rings the bell, bursts out of the snow globe with Cliff and gives Kipling the last bit of magic he needs to summon the Recreator with a dog that shoots magic energy (this cult’s own “book”). As its name implies, the Recreator immediately begins bringing people and things back into existence, and it settles into an epic staring contest with the Decreator and that...might just be how Doom Patrol’s world is now. What’s most impressive about “Paw Patrol” is how narratively dense it is while also not feeling too overpacked. The world is imperiled and then saved within an hour, but in that hour you see so much more of what makes the team’s characters who they are and how they’re growing into their new roles. Larry’s getting ahold of the Negative Spirit, Rita’s becoming more confident in her leadership skills and control of her powers, and Cyborg, well, his arm explodes in one of the show’s most horrific scenes yet. It’s a moment of true terror for the team that reminds you just how difficult their powers often make their lives, and why, at the end of the day, none of them are fully comfortable with calling themselves heroes yet.